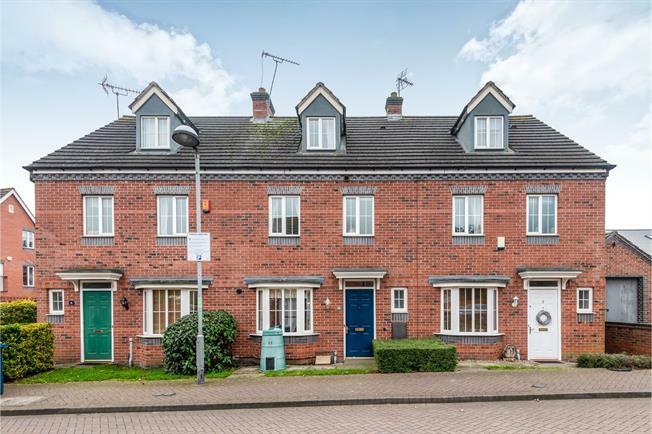 3 Bedroom Terraced House For Sale in Stafford for Offers in the region of £180,000. This modern three storey property offers superb accommodation comprising kitchen diner, lounge and guest WC. To the first floor there are three bedrooms and a family bathroom and a master bedroom to the third floor with en-suite shower room. Externally there is an enclosed garden to the rear with parking space and garage. The property also benefits from gas central heating and double glazing. Note: There is an annual maintenance charge of 250 payable for the upkeep of the estate roads/footpaths and common areas. Having tiled flooring, stairs to the first floor, radiator and coving. Having double glazed window and french doors to the rear overlooking the garden, radiator and coving. (measurements exclude bay window) Having a range of matching wall and base units with work surfaces over incorporating a one and a half bowl draining sink unit, built in electric oven with gas hob and extractor over, space for appliances, part tiled walls, tiled flooring, wall mounted gas central heating boiler and double glazed bay window to the front. Having low level WC, pedestal wash hand basin, tiled flooring, part tiled walls and double glazed window to the front. Having stairs to the second floor, storage cupboard and airing cupboard. Having double glazed window to the rear, radiator, built-in wardrobe and coving. Having double glazed window to the front, built-in wardrobe, coving and radiator. Having double glazed window to the rear, radiator and coving. Having panelled bath, pedestal wash hand basin, low level WC, part tiled walls, double glazed frosted window to the front and radiator. (measurements are into eaves and exclude wardrobes) Having double glazed window to the front, radiator, loft access, eaves storage cupboard and two built-in wardrobes. Having double glazed frosted window to the rear, low level WC, tiled shower cubicle, pedestal wash hand basin, part tiling to walls. To the front there is a small garden area and path to the front door. To the rear there is a lawned garden with planted borders, path which leads to the gate providing access to the parking space and garage at the rear.